In August, I told you it was time to buy agricultural commodities. After falling 60% from the beginning of the year, the PowerShares Agricultural Commodity Fund (DBA) – an exchange-traded fund made up of 17 different agricultural commodities – looked set to bounce higher. 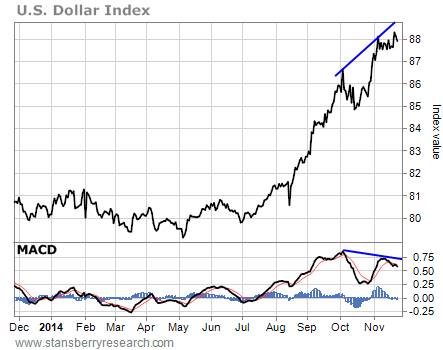 As you can see, the dollar index bottomed in early May and then rallied through October. The dollar pulled back briefly last month, but then it rallied to an even higher level. As regular Growth Stock Wire readers know, many commodities typically trade opposite of the U.S. dollar. So commodities rally when the dollar falls… And commodities fall when the dollar rallies. DBA peaked in early May just as the dollar index bottomed. As the dollar ran higher into October, DBA fell. But when the dollar pulled back briefly last month, DBA bounced off its bottom. [ad#Google Adsense 336×280-IA]Continuing this pattern, as the dollar rallied to a higher high recently, DBA pulled back. But here’s the important thing – it DID NOT make a lower low on the chart. DBA simply dropped back down to test the support of its former blue down-trending resistance line. Support held and DBA bounced again. This is a bullish price action for agricultural commodities. DBA held above support even as the dollar rallied to a new high. Now, take another look at the U.S. Dollar Index chart. As I said on Tuesday, the dollar index’s Moving Average Convergence Divergence (MACD) momentum indicator – a measure of overbought and oversold conditions – is now overbought. This is a warning sign of an impending decline in the dollar. Also, while the index has been hitting new highs, the MACD has been making new lows. This “negative divergence” is often the first warning sign a rally is nearing an end. With the dollar poised to fall, DBA has rallied up near its first red resistance line at about $26 per share. If DBA can break above $26 per share, it should move quickly to the next resistance line at about $26.60. That would be the third test of this resistance level in recent months. In the world of technical analysis, the more a resistance level is tested, the greater the chances of a breakout. So, in this case, the third time may be the charm. The next significant resistance level for DBA is just above $28. That’s my ultimate target for DBA’s rally. 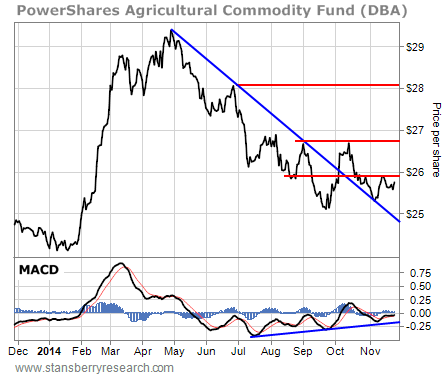 In short, agricultural commodities are poised to end the year with a strong rally. And if the dollar turns lower from here, it will provide a catalyst for a solid move higher in prices.